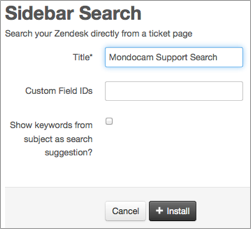 The Sidebar Search app helps agents solve tickets more efficiently by letting them search your Zendesk without leaving the ticket page. 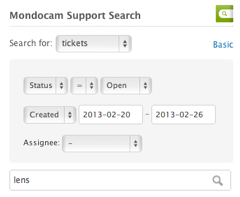 While working on a ticket, an agent can use the app to search for articles, tickets, comments, users, or organizations in your Zendesk. In the following example, the agent received a support request about returning a pair of shoes and searched for tickets with the terms "return" and "order". Find the Sidebar Search app, then click the title. Custom Field IDs: Optional. If you want the app to suggest the value of custom ticket fields, specify their IDs separated by commas. Show Keywords from Subject as Search Suggestion: Optional. Select this option if you want the app to suggest keywords based on the ticket's subject. Once installed, refresh your browser page for the changes to take effect. Display the Sidebar Search app on the ticket page by clicking the Apps button on the upper-right side of the page. Use the Search for: drop-down menu to define a basic search and press enter. Optionally, click Advanced to define a filter based on ticket status, dates the ticket was created or updated, or ticket assignee. Click a search result to open the page in a separate browser tab. If you check out step 4 above under To install Sidebar Search App, it indicates that you can specify the custom field ID if you want results from a certain custom field to be returned. Once you get that set up, you should start getting the Model Number field in your results. Here's what it looks like in our Zendesk. How do we enable comment searching? Also, it appears that selecting 'All Brands' in the advanced search will result in no results being returned. Specifying a single brand works as expected. Thanks for reaching out to Zendesk Support. Comments are still searchable, it's just that the wording changed. 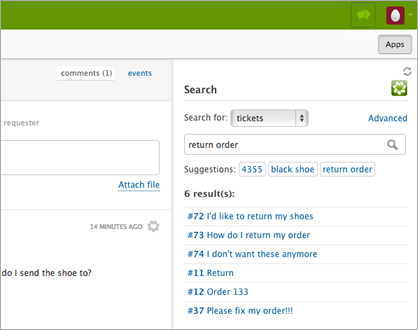 Comments on tickets are searchable by selecting the "Tickets" field and comments on Help Center articles are searchable by selecting the "Articles" field. If you have additional questions, can you tell me exactly how you want to use the Sidebar Search? For example, if I open the advanced search, specify a created date range and assignee and a search string, I get no results with the 'All Brands' option selected. I do get results if I instead specify a single one of our brands. I'd have expected the results from the specific brand to be included in the 'All Brands' filter, along with any other results from other brands. As far as your note about the brands search - this is a known issue that we are looking into, but thank you for bringing it to our attention - it is much appreciated! Hopefully a fix will be implemented soon! I have added a user custom field ID to the app configuration but unfortunately it won't find anything when I search by that field. I believe that this app will only search ticket fields, not user fields. I'm willing to bet that's the issue. Thanks Jessie.I thought too that was the case, I am not sure why I get that error though. Do you get that error when you search ticket fields? Have you tried uninstalling/reinstalling the app? If you can post a screenshot of the app set-up that would be helpful too. Is it possible to integrate external Knowledgebase and or Community search in the sidebar? You can't do that with the app in this article, but we do have an app called Answer Suggestion that does this!